Apple's get- ' em-while-they ' re-young strategy appears to be paying off. The iPod touch, which some tech analysts are calling an iPhone on training wheels, has proven wildly popular with gift-givers this holiday season. Amazon's list of Bestsellers in Electronics currently has the iPod touch 8GB (3rd generation, the newest model) in second place behind the Kindle e-reader. Third place? The 32-gig iPod touch. Meanwhile, San Francisco-based research firm Flurry is reporting that iPod touch downloads soared on Christmas Day. "It appears that an influx of new iPod Touch devices has flooded the market over Christmas, and that users of the handset, primarily pre-teen and teen audiences, are voracious downloaders," the report states. 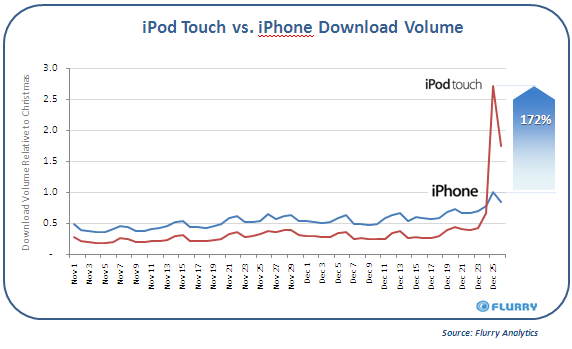 Total iPod touch downloads (all generations) rose by over 1000 percent on Christmas Day. iPod touch 3G downloads jumped by more than 900 percent on Christmas Day, as compared to the average of all previous Fridays in December. Flurry tracks over 10 percent of App Store download volume via an embedded mobile analytics app. "We can see downloads and application usage by consumers in real-time," writes Peter Farago, Flurry VP of marketing, in an email to PC World. "Since developers integrate our solution into their games and apps, we can detect specific devices, etc. This is how we can measure iPhone vs. iPod Touch downloads." "...Apple is using the iPod Touch to build loyalty with pre-teens and teens, even before they have their own phones (think: McDonalds' Happy Meal marketing strategy). When today's young iPod Touch users age by five years, they will already have iTunes accounts, saved personal contacts to their iPod Touch devices, purchased hundreds of apps and songs, and mastered the iPhone OS user interface. This translates into loyalty and switching costs, allowing Apple to seamlessly 'graduate' young users from the iPod Touch to the iPhone." Speaking as a parent who just bought his 12-year-old son an iPod touch for Christmas, I'd have to say that Apple's brainwashing is working brilliantly. My kid now has an iPod touch, as do many of his friends. At a Christmas party, I spotted other pre-teens playing with their brand-new iPod touches too. The biggest draw: App Store games and other downloadable fodder. As for their parents, they were thrilled the touch didn't require a pricey monthly contract, unlike the iPhone.